The Iraq war is still going on. It's been five years now. It's like we've almost forgotten, what with the subprime mortgage crisis and recession and all. But yeah, people are still dying, and we're draining money into the desert. 4000 U.S. troops have been killed. And we've spent over $500 billion in direct military costs. We continue to spend about $10 billion a month. Meanwhile, 4000 U.S. troops have died. That's two lives per day for every day of the war. It barely makes the news any more, when a roadside bomb kills a Humvee full of soldiers. But you can bet that for the families affected, it still matters. The good news? Only 10 months are left in Bush's presidency. 10 months. $100 billion. 600 deaths. Amanda went out last week. This week's theme: songs from the year of the singer's birth. It's the Beatles again... I guess tonight, we include Ringo and George. 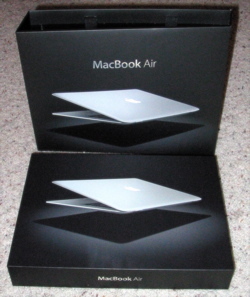 For my birthday, Amy got me a MacBook Air. Now, this isn't something I would have bought for myself. It's not that I didn't want it... it's just such a luxury item, I would have felt bad getting it for myself. So in that respect, it's a perfect present: something I really want but wouldn't buy for myself. Amy was worried that I didn't like it, since it's taken me so long to blog about it. Nothing could be further from the truth... I love love love my new baby. Meet the new addition to the family, "Liesel". Wow, I haven't done a "miscellany" post in a while. But there are a few stories I've seen recently that are begging for commentary. The New York Times posted a flow chart that diagrams the path of your life depending on whether you were exposed to Dungeons and Dragons early in life. I think the best part of this diagram is the little square in the lower left that says "doubting the technical accuracy of this diagram". I am certain that people who are familiar with flow chars AND who played D&D early in life will end up in this square. The University of Michigan has won a contract from the United States Army to design robotic bats. This is presumably either to combat the hordes of robotic mosquitoes that the terrorists plan to use against us, or to bombard the Ohio State football team with robot guano. I, for one, welcome our new robotic bat overlords. It's the Beatles, specifically Lennon/McCartney, for the first time ever. Wow. This could be phenomenal or disastrous. The songs are so well known, they're gonna have to try to make them unique somehow. Also: my three-week moving averages start tonight. You know, it's been so long since I've posted anything meaningful, I feel like I owe you something. So here's a little story for you. It's the story of when I moved to North Carolina. 80s night continues, and Paula is more drunk than ever.